Yes... But At What Cost? This is how our entire status quo maintains the illusion of normalcy: by avoiding a full accounting of the costs. The economy's going great--but at what cost? "Normalcy" has been restored, but at what cost? Profits are soaring, but at what cost? Our pain is being reduced--but at what cost? The status quo delights in celebrating gains, but the costs required to generate those gains are ignored for one simple reason: the costs exceed the gains by a wide margin. As long as the costs can be hidden, diluted, minimized and rationalized, then phantom gains can be presented as real. 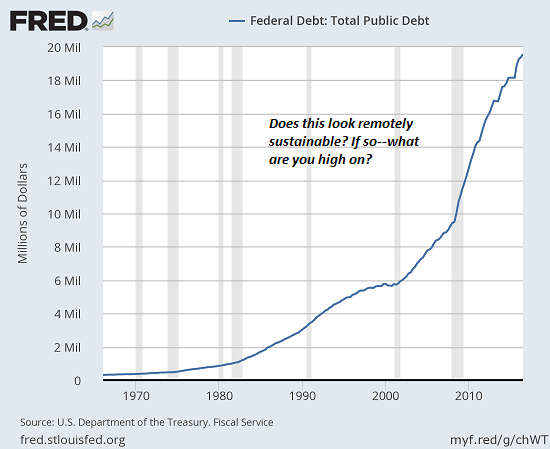 Exhibit One: the US public debt. 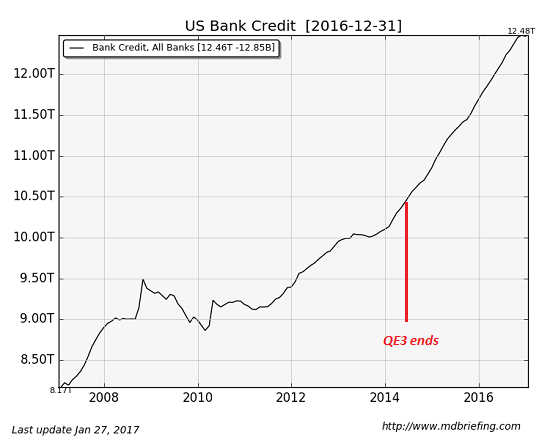 If you borrow and blow enough money, it's not too difficult to generate a bit of "growth"--but at what cost? Exhibit Three: student loan debt. 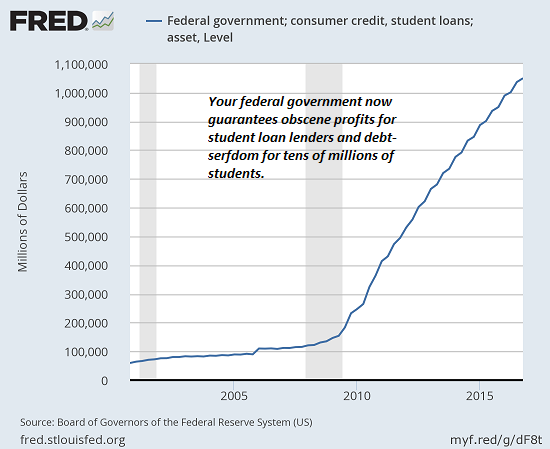 Here's a chart of debt that is federally originated but paid by individual students: the infamous student loan debt that has shot up over $1 trillion in a few years. Americans are in pain, and the cartel-sickcare "solution"--"non-addictive opioids"--is reaping a horrendous toll on all who trusted the sickcare system to deliver non-addictive painkillers. 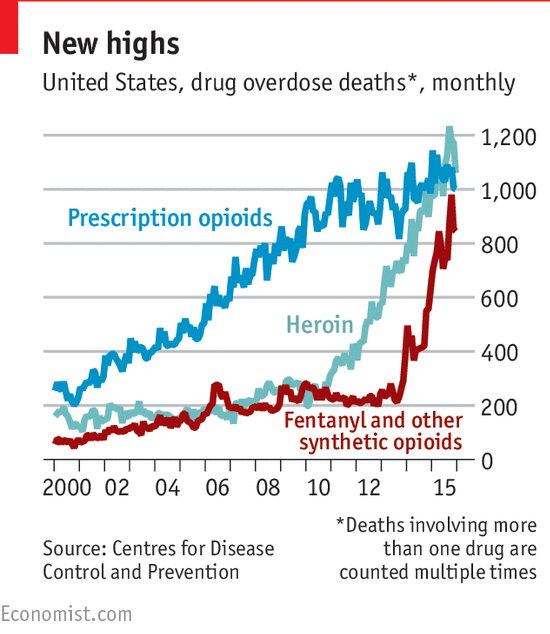 Should the newly addicted sufferer no longer be able to get the synthetic opioid prescribed, the option of choice is street smack (heroin), and this is why heroin deaths are soaring along with deaths caused by synthetic opioids. Pain has been relieved--but at what cost? The elites within the Big Pharma and higher education cartels are reaping enormous salaries, bonuses and benefits while these cartels wreak havoc on America's vulnerable underclass (i.e. the bottom 90%). Monumental sums of cash are flowing from the many to the few while the many become addicted to opioids or enslaved to student loan debt. The financial media is euphoric over the billions of dollars of profits reaped by smart phone manufacturers--every kid needs one, right? But at what cost, not just the financial cost, but the cost in addictive behaviors spawned by smart phones? iPhones and Children Are a Toxic Pair, Say Two Big Apple Investors (WSJ.com) The iPhone has made Apple Inc. and Wall Street hundreds of billions of dollars. Now some big shareholders are asking at what cost. This is how our entire status quo maintains the illusion of normalcy: by avoiding a full accounting of the costs of a system set to maximizing profits by any means available, a system of public-private pillage overseen by the protected few at the expense of the vulnerable many. It's as if we've forgotten that debt accrues interest, i.e. claims on future income. Debt is easy to ignore in the initial euphoria of spending the "free money," but once the depreciated value of what was purchased and the interest starts weighing on the borrower, the borrowed money is revealed as anything but "free."